The Memor 10 from Datalogic ensures for more performance at top performance, with a 5’’ full touch display, 13 megapixel camera and an ultra-modern 2D scanner. It features WLAN, WWAN/Cellular, LTE, Bluetooth 4.2 and NFC, and has an Android 8.1 operating system. The mobile computer has been validated for the »Android Enterprise Recommended« program for robust mobile computers. This makes it a sustainable investment with a long life cycle. Your customers receive security updates every 90 days over the next 5 years, as well as one complete operating system update. 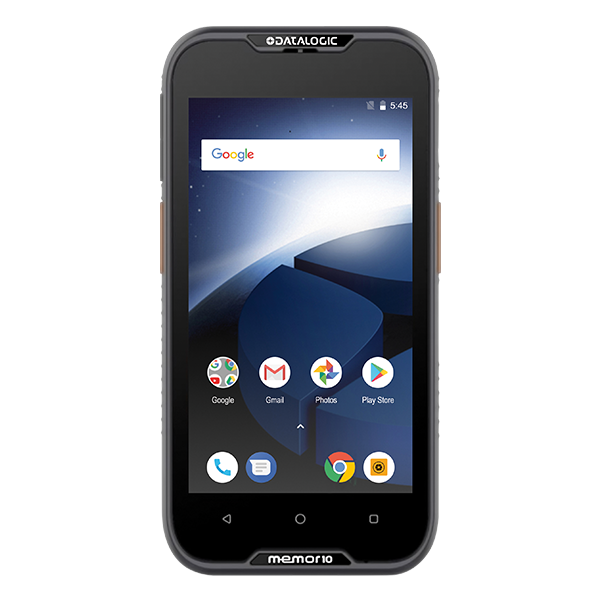 The Memor 10 has an exchangeable battery and a proximity charging function. It's also very robust: it withstands impacts from 1.5 meters and is IP65-certified. Order the Memor 10 from Datalogic with your sales representative. Make the call today! * Requires Datalogic Shield which is included with all EASEOFCARE contracts for Memor 10. Datalogic Shield will also be available for purchase as a »software-only« contract starting upon launch of the service in early 2019.